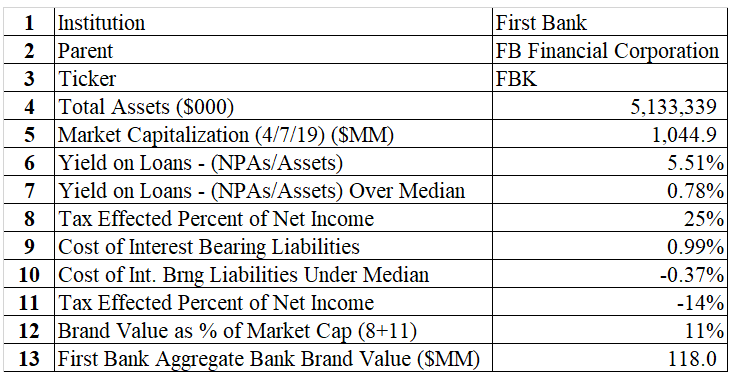 Jeff For Banks: Bank Brand Value: Calculated! I ask and ask and ask: what does brand get you? Does it get you pricing power, shorter sales cycles, better employees, more loyal customers? Or does it get you increased expenses without measurable results? Forbes calculated brand value in their "World's Most Valuable Brands" by taking anything that a company achieves over an 8% return on equity. Many people pay close attention to the ranking. Although I find the calculation to be arbitrary. What if the company is more capital intensive, and has to carry more capital than other companies? So the ROE is lower. Or what if a company is excellent at expense control? Driving ROE higher, but hardly due to its brand. No, I do not like Forbes' calculation. It particularly doesn't work well for financial institutions. Which is probably why the first bank on their list is ranked 43rd. And it's Wells Fargo! Didn't help out Tim Sloan. So how would I calculate a financial institution's brand value? When I speak, I use great brand images such as Starbucks, JW Marriott, and Mercedes Benz. Why do these brands command higher price points than Dunkin, Best Western, and Kia? Price points. A superior brand usually would command superior price points. And we can measure this by looking at a financial institution's cost of interest bearing deposits, and yield on loans, compared to other regional players that have similar balance sheets. Spread is usually 80%-85% of a community bank's revenues. An inferior or non-existent brand likely grows deposits and loans via decisions made in pricing committee. Fortunately, we have good data via Call Reports to make the calculation. And I propose the BBV method so you can calculate and track your BBV. The first step is to select regional financial institutions with a similar size, in the below case $1 billion - $10 billion in total assets. 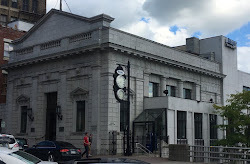 I selected a bank in this group, First Bank of Nashville, Tennessee, because I was recently there. I then searched for banks with a similar loan composition to First Bank; fifty-to sixty percent commercial and commercial real estate loans to total loans. I netted yield on loans by their npa's/loans so those banks with riskier loan books are discounted. Banks that achieve a better than median yield on loans after netting npa's/loans, with a similar loan book in a similar region, likely do so because they are perceived to deliver better value to customers. i.e. brand. And First Bank passes this test, achieving 78 basis points over the loan peer median. I then ran a second peer group for cost of interest bearing deposits. I kept it regional, and the same asset size range. And used less than 30% funded with time deposits, as First Bank was funded 27% with CDs. I could not use transaction accounts because of financial institutions' reclassing transaction accounts to savings/ money market accounts to reduce their Fed requirement. Anything under the median cost of interest bearing deposits, I attributed to brand. This didn't work out so well for First Bank, as their cost of interest bearing deposits was 37 basis points greater than deposit peer median. And then I added those two numbers together, giving a pre-tax brand value, and then tax effecting it and calculate as a percent of net income. 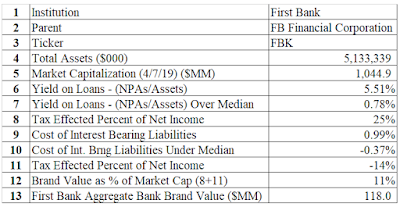 If the bank is publicly traded, as First Bank is (Ticker: FBK), you can then calculate the BBV percent of net income as the percent of market capitalization to get an aggregate brand value. If not a publicly traded bank, you can calculate the BBV contribution to net income and multiply by a peer p/e multiple to get your aggregate BBV. My suggestion is that you trend your BBV, looking to continuously improve. In First Bank's case, I would look to maintain my loan BBV advantage, and continuously improve my deposit one. Imagine continuous improvement of BBV as a strategic planning SMART goal? See the table. Calculate your own BBV. How did you fare?